Spanning two city blocks, the $300 million Atlantic Crossing mixed-use development is underway to revitalize the east end of Downtown Delray Beach’s nationally recognized Atlantic Avenue. Representing the largest private investment in the City’s history, this venture by the Edwards Companies of Columbus, Ohio, is bringing first-of-its kind high quality retail and restaurant space, Downtown’s first Class A office quarters and new luxury residential choices to the heart of the City. A number of leases already are in process for the 73,000-square-foot retail component and 83,000 square feet of office space, with the initial space coming online in fourth quarter 2019. The plan’s luxury apartments will open first quarter 2020, followed by condominiums overlooking the City’s Veterans Park along the Intracoastal Waterway. 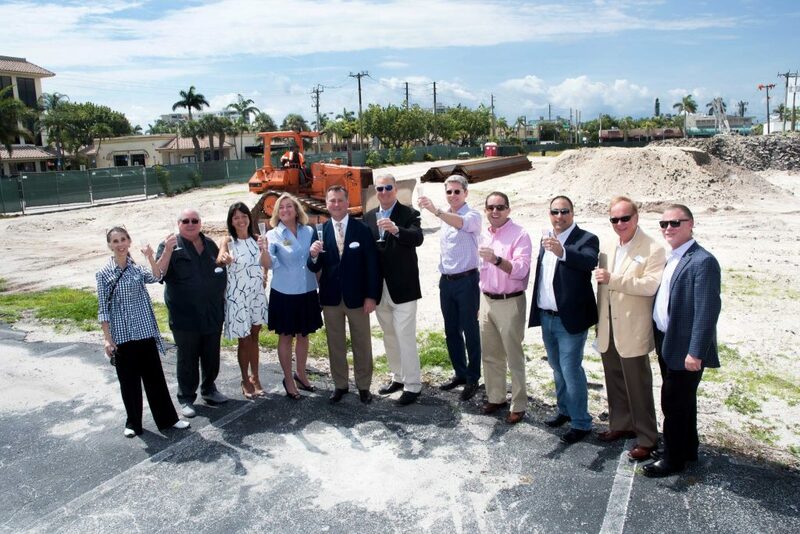 At the groundbreaking, Jeff Edwards, President of the Edwards Companies, invited city officials and guests to toast Downtown Delray’s future. “From the outset, we viewed Atlantic Crossing as a rare opportunity—and our confidence has only grown over the six years the project has been in design and review. We’re excited to create a new hub of city life here,” he said. He noted that for the first time, mid- to large companies seeking corporate caliber, large floor plate office space will be able to choose Downtown Delray Beach. Delray Beach is one of the nation’s Top 10 Downtowns, with the potential to become a Carmel by the Sea or Nantucket, according to Robert Gibbs, nationally known retail consultant and author of a 2017 Shopabilility study commissioned by the City’s Downtown Development Authority. He also cited Downtown Delray’s walkability score — 92 out of 100 – a draw for today’s best retailers. Overall, the Atlantic Crossing plan, including the residential components and generous public spaces, has a five-year build out and is projected to generate $2.6 million in annual tax revenues and 600 permanent jobs. In line with Downtown Delray’s eclectic feel and walkability, each of Atlantic Crossing’s six buildings has a different architectural design. All parking is hidden, below ground or in a garage wrapped by residences, and convenient valet service is provided.